Background Prior research has shown a transient increase in the incidence of acute myocardial infarction (AMI) after daylight savings time (DST) in the spring as well as a decrease in AMI after returning to standard time in the fall. These findings have not been verified in a broader population and if extant, may have significant public health and policy implications. Methods We assessed changes in admissions for AMI undergoing percutaneous coronary intervention (PCI) in the Blue Cross Blue Shield of Michigan Cardiovascular Consortium (BMC2) database for the weeks following the four spring and three fall DST changes between March 2010 and September 2013. A negative binomial regression model was used to adjust for trend and seasonal variation. Results There was no difference in the total weekly number of PCIs performed for AMI for either the fall or spring time changes in the time period analysed. After adjustment for trend and seasonal effects, the Monday following spring time changes was associated with a 24% increase in daily AMI counts (p=0.011), and the Tuesday following fall changes was conversely associated with a 21% reduction (p=0.044). No other weekdays in the weeks following DST changes demonstrated significant associations. Conclusions In the week following the seasonal time change, DST impacts the timing of presentations for AMI but does not influence the overall incidence of this disease. This study identifies changes in the rate of AMI, beyond those expected by random or seasonal variation, associated with daylight savings time. This analysis includes a broad patient population across all hospitals throughout the state of Michigan with plausible extrapolation nationally. The study only includes patients treated with PCI (the pre-eminent treatment for AMI) and could not assess changes in those receiving CABG or medical therapy. More than 1.5 billion people in 70 countries around the world observe daylight savings time (DST). In the USA, outside of Arizona and Hawaii, all citizens turn their clocks forward by 1 h in the spring and backwards by an hour in the fall. Prior research has shown a transient increase in the incidence of acute myocardial infarction (AMI) after DST in the spring as well as a decrease in MI after returning to standard time in the fall in other countries.1 Smaller studies have shown similar effects of DST in the USA.2 These provocative findings have not been verified in a broader US population and if extant, may have significant public health and policy implications. We examined the change in incidence of patients undergoing percutaneous coronary intervention (PCI) for AMI in the week after DST changes in the state of Michigan. Procedural data for hospital admissions where PCI was performed in the setting of AMI between 1 January 2010 and 15 September 2013 were included in this analysis. AMI was defined by a clinical presentation consistent with or suggestive of ischaemia, suggestive or diagnostic ECG changes and cardiac biomarkers (creatine kinase-myocardial band, troponin T or I) exceeding the upper limit of normal according to the individual hospital’s laboratory parameters (typically above the 99th centile of the upper reference limit for normal participants).5 Cases not resulting in PCI are not tracked and therefore excluded in this analysis. The timing of AMI was the time patients presented to the hospital’s emergency room. The number of patients with AMI undergoing PCI per day was calculated for each day during the study period. A negative binomial regression model was fitted using the R function glm.nb in the package MASS to assess the existence of and account for trend and seasonal variation in the time series of daily AMI counts.6 ,7 This model allowed for a cubic trend in numeric date as well as seasonal factors reflecting weekday (Monday–Friday), monthly (January–December) and yearly (2010–2013) effects. The model also adjusted for the additional hour on the day of each fall time change, as well as the loss of an hour on the day of spring time changes through the inclusion of an offset term. Residuals from the trend/seasonality model were evaluated for residual serial correlation through examination of partial autocorrelation plots and through the Durbin-Watson test statistic, with the p value for the test obtained through bootstrap resampling. The partial autocorrelation function at lag h is an estimate of the correlation between outcome values at all possible time points t and t−h conditional on the observations between time points. Plots of the partial autocorrelation for lags between 1 and 100 days were utilised in this analysis. The impact of the spring and fall time changes on AMI incidence adjusting for seasonality and trend was assessed through the addition of indicator variables reflecting the days following spring and fall time changes as predictors to the initial trend/seasonality model. To assess the potential impact of serial correlation on our results, a supplemental autoregressive time series analysis was performed.8–11 In this analysis, the trend model residuals (actual AMI count—predicted) were utilised in an AR(7) autoregressive model assuming normality, with significant DST predictors from the negative binomial model included as external regressors.12 ,13 The appropriateness of the normality assumption was assessed visually using quantile–quantile plots and histograms, as well as through the Kolmogorov-Smirnov test. No adjustments were made for multiple comparisons, and the analysis is intended to be exploratory in nature. As such, nominally significant results should be interpreted as hypothesis generating, rather than confirmatory evidence. No extramural funding was used to support this work. The authors are solely responsible for the design and conduct of this study, all study analyses, the drafting and editing of the paper and its final contents. In this study, 42 060 hospital admissions for AMI requiring PCI occurred during the study period. Figure 1A provides a plot of the daily PCIs performed for AMI over 1354 days included in the study period. The median daily AMI total was 31, ranging from a minimum of 14 to a maximum of 53 admissions. The data demonstrate substantial trends and seasonal patterns. Examination of the partial autocorrelation function plot (figure 1B) reveals autocorrelation signals at intervals of 7 days, suggestive of a weekday pattern. After adjustment for trend and seasonal effects, the time series appears reasonably stationary (figure 2A), with a sharp reduction in the extent of autocorrelation (figure 2B). The Durbin-Watson test statistic value for model residuals was 1.95 (p=0.17), suggesting little evidence of serial correlation. 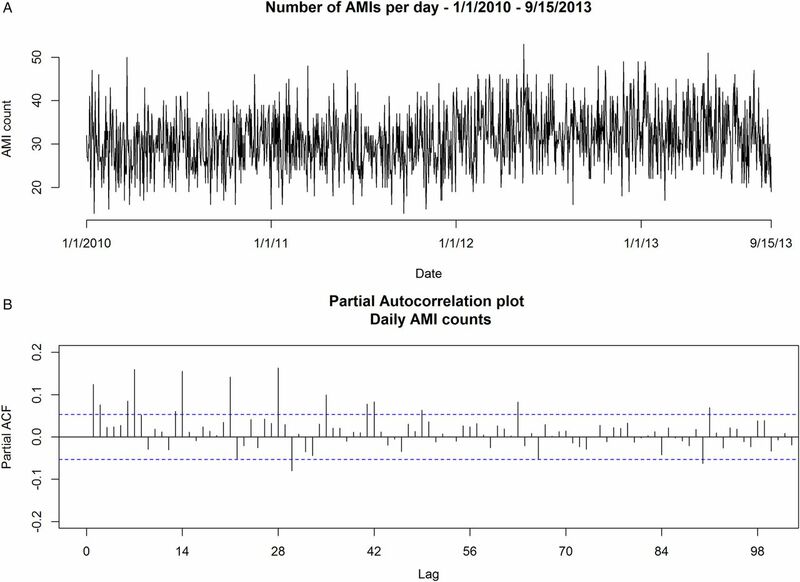 (A) Acute myocardial infarction (AMI) counts over time and (B) partial autocorrelation plot of AMI counts. 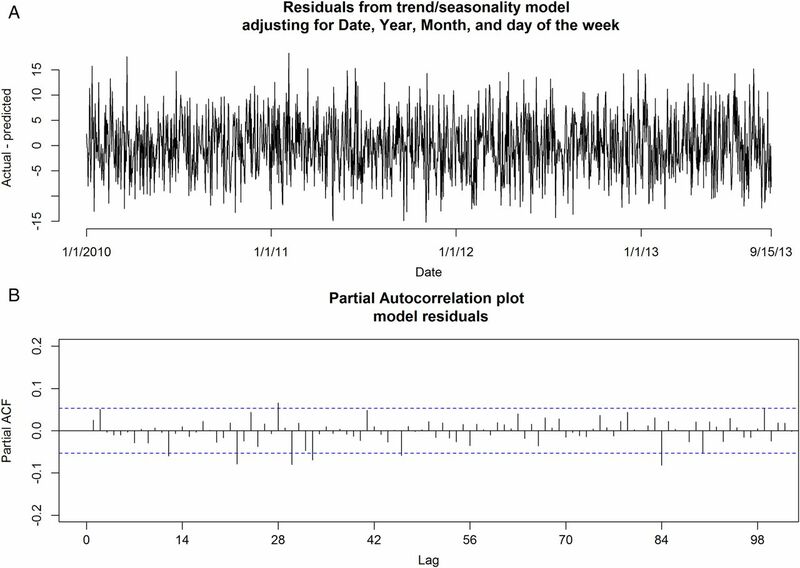 (A) Trend model residual time series and (B) partial autocorrelation plot. 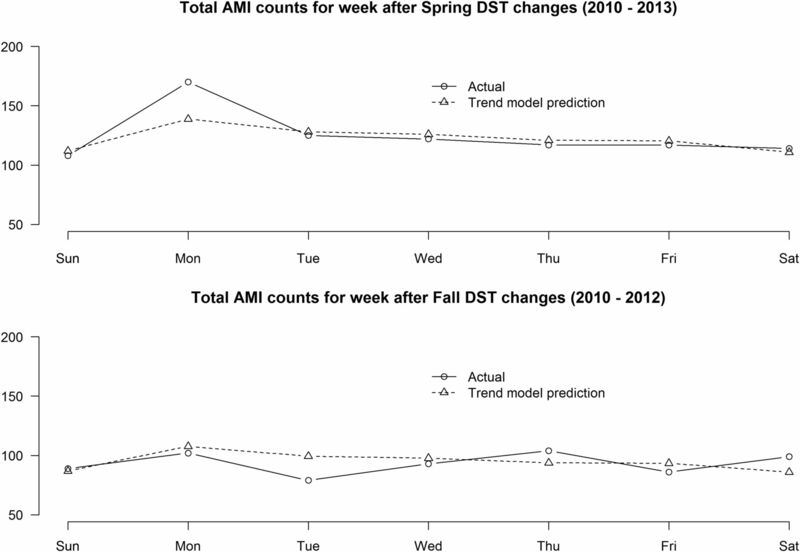 Total AMI counts and trend model total counts for the weeks following spring and fall time changes are provided in figure 3, and table 1 provides relative risk estimates along with 95% CIs and p values for each of the weekdays following DST changes from a multivariate negative binomial regression model adjusting for trend, seasonality and the number of hours of exposure for the day of DST changes. The Monday following spring time changes was associated with a 24% increase in daily AMI counts (p=0.011), and the Tuesday following fall changes was conversely associated with a 21% reduction (p=0.044). No significant difference in total weekly counts or for any other individual weekdays in the weeks following DST changes was observed. Actual and predicted acute myocardial infarction (AMI) counts for the weeks after the spring and fall daylight savings time (DST) time changes. A supplementary AR(7) autoregressive model produced consistent results for both the Monday following the spring change (expected increase of 7.8 AMIs/day, p<0.01) and the Tuesday following the fall change (expected decrease of 7.1 AMIs/day, p=0.034). The normality assumption implicit in this modelling strategy was evaluated and found to be reasonable using graphical methods (see online supplementary figure S1) and through the Kolmogorov-Smirnov test of normality, which did not find significant evidence of non-normality (p=0.67). In our study, we found a significant increase in the volume of PCI for AMI on the Monday following the spring DST time change with no significant change in the total volume of PCI for AMI in the week after DST. Manipulations of the sleep–wake cycle have been linked to imbalance of the autonomic nervous system, rise in proinflammatory cytokines and depression.14 Our study corroborates prior work showing that Monday carries the highest risk of AMI.15 This may be attributed to an abrupt change in the sleep–wake cycle and increased stress in relation to the start of a new work week. In addition, analysis of the fall time change shows a modestly significant decrease in the volume of PCI for AMI on the Tuesday after the fall DST. As noted for the spring DST, there was no significant difference in the total volume of PCI for AMI in the week following the fall DST time change. This suggests that exiting DST in the fall may allow for increased sleep resulting in a modest shift in AMI presentations requiring PCI in the week after the fall time change. Our findings corroborate and extend the results from prior studies. Janszky et al16 added to their original work by analysing the impact of DST on the incidence of AMI in a broad population in Sweden. Their work showed a modest increase in the incidence of AMI the week after the spring time change with no change in the incidence of AMI after the fall time change. A prior small study from two hospital centres in Michigan has shown that shifts to and from DST impact the incidence of AMI.2 However, this analysis was limited by a small patient sample at two hospital centres as well as comparison to a limited time frame surrounding the weeks before and after DST. In a large patient population across a diverse hospital network covering the entire state of Michigan, our findings suggest that the Monday after the spring DST carries significantly increased rates of AMI requiring PCI. In addition, our study found a decrease in the incidence of AMI requiring PCI on the Tuesday after exiting DST in the fall. Our data argue that DST could potentially accelerate events that were likely to occur in particularly vulnerable patients and does not impact overall incidence. There is considerable controversy over the health and economic benefits of DST, and some authorities have argued that this practice should be abandoned.17 Although we are unable to comment on the merits of these arguments, our data suggest that while such a move might change the temporal fluctuations in AMI, it is unlikely to impact the total number of MIs in the broader population. The results of our study should be interpreted with the recognition of certain limitations. Our analysis was conducted using data from Michigan, a large state in the mid-west; as such our findings may reflect a regional rather than national finding. Second, we only evaluated patients who were treated with PCI for AMI. The registry does not track patients undergoing CABG or those treated with medical therapy and cannot account for the total incidence of AMI in the state. However, PCI is the predominant therapy for AMI in this population and our findings are probably extant. Our findings identify changes in the rate of AMI, beyond those expected by random or seasonal variation, associated with DST. Importantly, they note a marked increase in the volume of PCI for AMI on the Monday after the spring DST. The utility of our findings centres on appropriate tailoring of resources for optimised patient care. Strengths of our analysis include a broad patient population across hospitals throughout the state of Michigan with plausible extrapolation nationally. Identification of periods of increased MI activity nationally could allow for improved cardiovascular patient care and preparedness of healthcare systems. Finally, our findings provide impetus for further study in the connection between the circadian rhythm, sleep–wake cycles and the cardiovascular system. Increased rates of AMI requiring PCI were identified on the Monday following the spring DST change. Decreased rates of AMI requiring PCI were identified on the Tuesday following the fall DST time change. No change in the total volume of PCI for AMI was seen in the weeks preceding or following either DST time change. Further work exploring the impact of these findings on cardiovascular care should be considered.
. Shifts to and from daylight savings time and incidence of myocardial infarction. N Engl J Med 2008;359:1966–8.
. Incidence of myocardial infarction with shifts to and from daylight savings time. Am J Cardiol 2013;111:631–5.
. The relative safety and efficacy of abciximab and eptifibatide in patients undergoing primary percutaneous coronary intervention: insights from a large regional registry of contemporary percutaneous coronary intervention. J Am Coll Cardiol 2008;51:529–35.
. Association of a continuous quality improvement initiative with practice and outcome variations of contemporary percutaneous coronary interventions. Circulation 2006;113:814–22. ; Joint ESC/ACCF/AHA/WHF Task Force for the Redefinition of Myocardial Infarction. Universal definition of myocardial infarction. Eur Heart J 2007;28:2525–38.
. Homogeneity of results in testing samples from Poisson series. Biometrika 1940;31:313–23.
. Modern applied statistics with S. 4th edn. New York: Springer, 2001. ISBN 0-387-954557-0.
. Introduction to time series and forecasting. New York: Springer, 1996. Sections 3.3 and 8.3.
. Time series analysis by state space methods. Oxford University Press, 2001.
. Time series models. 2nd edn. Harvester Wheatsheaf, 1993. sections 3.3 and 4.4.
. Algorithm AS154. An algorithm for exact maximum likelihood estimation of autoregressive-moving average models by means of Kalman filtering. Appl Stat 1980;29:311–22.
. Maximum likelihood fitting of ARMA models to time series with missing observations. Technometrics 1980;22:389–95.
. Impact of sleep debt on metabolic and endocrine function. Lancet 1999;354:1435–9.
. Excess cardiac mortality on Monday: the importance of gender, age and hospitalization. Eur J Epidemiol 2005;20:395–9.
. Daylight saving time shifts and incidence of acute myocardial infarction—Swedish Register of Information and Knowledge about Swedish Heart Intensive Care Admissions (RIKS-HIA). Sleep Med 2012;13:237–42.
. Does daylight saving time save energy? Evidence from a natural experiment in Indiana. Rev Econ Stat 2011;93:1172–85.